Explore the endless chain of lovely meadows along the Lyell Fork. 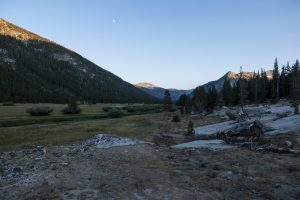 Take the spur trail south to the John Muir Trail and make a left to follow the Dana Fork upstream. The trail crosses over the Dana Fork before going up and over a small, wooded rise to the Lyell Fork and the wonderful twin bridges. A beautiful meadow spreads out on the other side and is a brief preview of the rest of the canyon. The trail enters the trees and cruises through the forest, mostly away from any meadows until past the bridge over Rafferty Creek. Meadows become more frequent as you continue west, but the real joy is after the trail makes a turn to head southwest. You encounter larger meadows and come alongside the river; sometimes slow and meandering, sometimes cascading and playful. Surrounding mountains begin to peek above the trees while small ponds make appearances on the other side of the river. 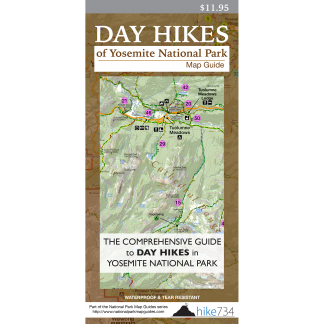 The trail bounces between forest and large, open meadows as it alternates over dirt and granite slabs. Portions of the trail can be muddy earlier in the year, but dry out later in the summer. The trail reaches a natural turnaround point at 8mi/12.8km at the head of a large meadow. Kuna Creek crashes down the hillside opposite the meadow and tall summits tower overhead. For an epic day, continue up the arduous switchbacks to sublime alpine lakes and granite landscapes to Donohue Pass (total round trip is 25.4mi/40.9km with an elevation gain of 2,700ft/810m).